Sarah Cooper hails from Hervey Bay, and is an emerging artist going from strength to strength! 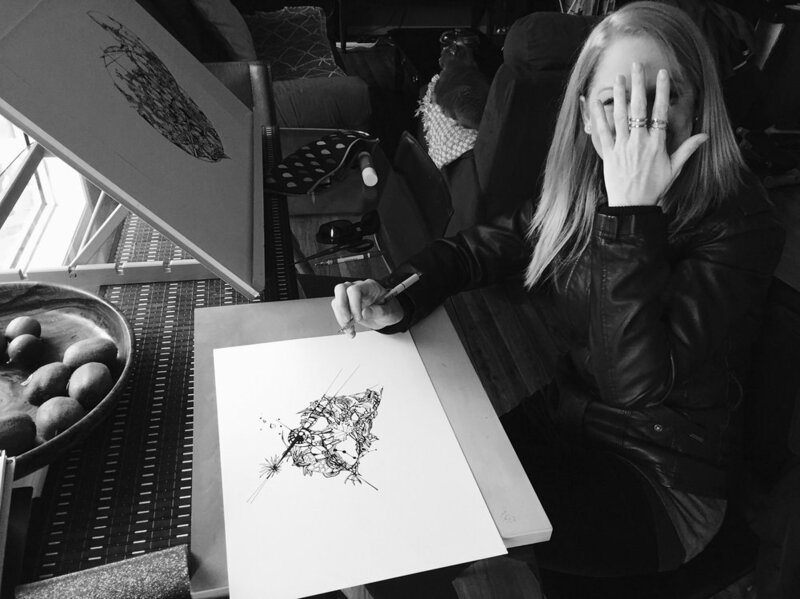 She was one of our featured artists from earlier in the year with her article Art Spectator Turned Artist. Here she shares her acrylic pouring swipe technique, step-by-step so you can follow from home. Thanks Sarah! Acrylic paint – high flow is best but any of the cheaper brands will do the job just fine. But probably best not to use the thicker paints like Matisse ‘Structure’ because it will be way too hard to get make the paints flow. 2. Pouring medium – I usually use Floetrol, available from hardware stores, but there are quite a few other artist brands available. Atelier have a good one, as does Liquitex, but you can decide based on your budget! I think Floetrol is the best value, especially while you’re still experimenting. 3. Silicone oil – there is quite a variety of silicone oil based products available that will work, and the use of this material is totally optional. You can get really great cells without it, and even if you do use it, it’s important to know that less is more! You only need a couple of drops in one of your colours (I think it works best in darker colours). I use WD40, because it’s a cheap and an easily available option; I can buy it while I’m grocery shopping, so no extra trips to Bunnings or the art shop required. For a really dappled effect you could just spray a little burst over paint you have poured, but don’t expect big cells from this, you’ll get lots of little ones. I used the extender nozzle to spray into a small bottle with a dropper so I can easily put a few drops in my paint before I pour. Alternatives to the WD40 include treadmill oil, KY lubricant, coconut oil hair serum, and some You Tubers have even mentioned using things like dishwashing detergent or Windex (but I haven’t tried these). 4. Pop-sticks – Use these to mix your paints. They’re cheap and you get heaps in a pack – plus you can easily wash and reuse them, which is always good. 5. Plastic cups – also good for their re-useability, you will need these to mix your paints in. 6. Stretched canvas or board – I wouldn’t use an un-stretched canvas because it will lose its shape and warp when the paint dries and the paint will pool in ways you don’t want it to. Cheap canvases from your local bargain store will do just fine, or you could use a ply or MDF board. Beware of using boards that are too thin as they can warp (and you won’t be able to put hanging wire on the back), or any other canvas boards that don’t have the canvas stretched right over the board. I have had the canvas shrink back as the paint dried and expose the edge of the board underneath. Not a good look! 7. Canvas raiser: you will need something to keep your canvas raised off the table so the wet paint doesn’t stick to it. I just use empty containers because I can’t stand throwing things away! They (obviously) have to be the same height so if you use a lot of the same product, start collecting the containers. For me, it’s yoghurt and Nuttelex! I have seen some ingenious people using those corkboard pins with the flat tops and sticking them into the underside of the canvas to raise it off the table, but I prefer a little more room for my hands to get under. Also, a hot tip I picked up if your surface is not completely level, you can grab a pack of screw-in ceiling hooks to put into the back of your canvas and adjust the levels by screwing further in or out. 8. Swiping tool – for this tutorial I have used a swipe technique. You can use paper towel (slightly dampened), a long cake-decorating spatula, a piece of cardboard or hard plastic – basically, anything you can lay across the canvas and swipe the paint with. I even used a broken foam cover from my kids’ trampoline on this painting! Seriously, anything will do! 9. Kitchen torch: Some people like to use a kitchen torch to help pop any bubbles in the paint and bring up cells. I am one of these but there are some pouring artists who don’t use one and their work is totally amazing (check out Mely D for example). SAFETY HAZARD WARNING! My el-cheapo torch doesn’t always turn off when I ask it to. Invest $$! Make sure you have a big enough space because you are going to make a mess. It’s a good idea to line the table, and possibly the floor, with a sheet of plastic or alfoil to catch the excess paint. Also, you want to make sure your surface is level; the paint takes a long time to dry because there’s so much of it, and it moves! Pretty much every acrylic pour artist I’ve seen has a different formula they like to use for mixing their paints. What works for me is to use about a 70/30 ratio of Floetrol to paint. (That’s an extremely approximate ratio – I don’t actually measure). I put about a 50 cent coin sized blob of paint into a cup and then add the Floetrol until I reach the runny consistency I need to get a good flow of paint. Some people add water, but I find it dulls the effect of the dried paint and some colours can blend into others too easily and I end up with a muddy or washed out result. The more expensive pouring mediums may not need as much to thin the paint, but my budget doesn’t allow for too much experimentation with this! You need to stir it up thoroughly and let it sit for at least 10 minutes so that the little air bubbles can rise to the surface and pop. I then give each colour a gentle stir just before I pour it, just to make sure it’s not too thick on the bottom and I add my few drops of silicone to the phthalo blue. *Tip: If you find some of your paint is lumpy you can strain it through a tea strainer or flour sifter. So you’ve got your space all ready, your canvas is raised and your paint is mixed… it’s time to pour! (At this point I always feel a my levels of anxiety and adrenaline rising. I’m not sure if this is normal – maybe you will feel it too, maybe you won’t). I digress. For this painting technique, I am going to pour the paint colours on one-by-one to try and achieve the appearance of the ocean meeting the shore. I am starting with the darkest blues at one end as the deepest part of the ocean, and am adding in the green and turquoise, as the water gets closer to the shore. Then I’m adding a little metallic bronze and an ochre that’s had quite a lot of white added to it to tone it right back to a sandy colour. Finally, I’m pouring some white in a few places amongst the blues and greens hoping to get some foamy effects of the breaking waves. I’m also pouring the white right along the edge of the canvas on the sandy end because that’s the place I’m going to swipe from and I want that white to filter back through the rest of the painting. Before I go ahead and swipe, I want to make sure the edges are all covered neatly and completely. I think this style of painting looks best when the paint wraps around the whole canvas. Now for the moment of truth. I’m starting the swipe with this crazy, broken piece of foam from the trampoline. It’s just like a thin pool noodle and I want to see how it works. I haven’t used this before but it’s a good size, so why not? It turns out the foam noodle wasn’t completely flat, but that’s ok, cake spatula to the rescue! What I wasn’t able to pick up with the foam, I can go back and re-swipe with the spatula. I can move the paint around, very gently, until I’m happy with where everything is sitting. There’s plenty of time to stand back and have a look at the composition and decide whether there are any areas you want to fix up. I’ve just grabbed a bit of blue paint from the drips on the table to fix up this corner that the swipe has missed. So, I’m pretty happy with how this looks but I’m just giving it a torch to see if anything pops. Cells will form over time as the paint dries and shifts, so if you don’t torch, don’t worry. There are cells appearing straight away here, which is awesome, and typical of this technique as the paints interact with each other. I’m really happy with this painting! This is my first ‘beachy’ swipe and the first pour painting I’ve actually done with an intended outcome. If you do decide to give this a go, don’t feel that you have to make any kind of recognisable picture or composition with what you do. Play with your favourite colour combinations and see what happens! I am having so much fun trying new things and there are so many different ways to use acrylic pouring to get different effects. I have included an image of the dried result so you can see how much darker the paint goes. At first I was a little disappointed because I loved the colours and the shine of the wet paint, but the more I look at it dry, the more I see the depths of the sea in the deeper colours and I still love it! I hope you have enjoyed this little tutorial; I certainly had fun making it! 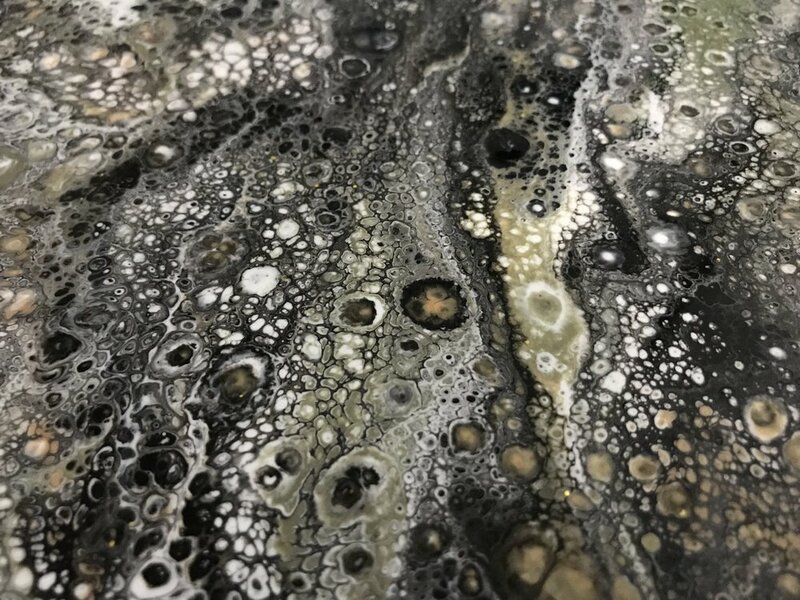 If you want to know more, or if you think I’ve missed something, contact me on Instagram @sarahcooper_art or my CoopArt page on Facebook @sazzc.fluidart.